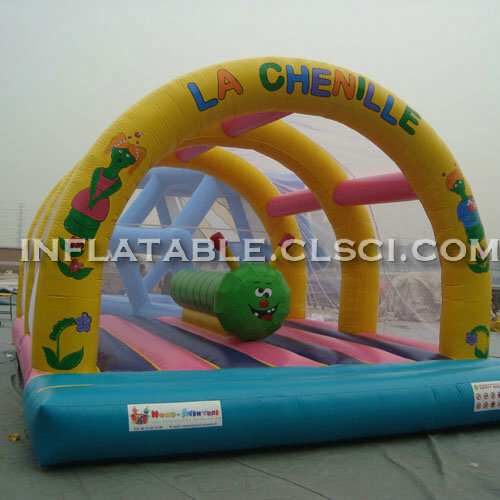 Chinee Inflatables,a top inflatable manufacturer,sells good price and quality Bounce Houses T2-3203. Size(L*W*H): We offer different size according to customer’s request. Stitching: Double stitching & quadruple in areas of high tear and at every corner. Blower: CE or UL for different area using, plug can also be customized. Deflation: Heavy duty quickly deflation zips. Accessories: Blower/ carrying bag /Repair kits and etc. 2. Our wider joint part is 2.5cm from which most of other factories is 1cm. 3. We double stitching everywhere, with fourfold stitching at bottom stress point. 4. It is suitable for family, school, playing center, and amusement park, etc. 1. 18 years concentration in inflatable industry. 2. We have 30 pcs sewing machines,5 pcs hot air machines, 1 piece high definition printing machine and1 piece automatics cutting tables. Chinee inflatable games are made by high durability fire-retardant 18OZ Tarpaulin,which has 3 layers , two coated side with a strong net inside. The flame retardant meet BS7837.The material we uses has one of the highest tear resistance ratings in the world: 25 kg./250N and our material can meet EN71 requirements:UVresistant,fire retardant and innoxious. 4. We double stitching everywhere, with fourfold stitching at bottom stress point. Double stitching inside and double stitching outside to make sure the inflatables are strong enough.the most important thing is our seams are done using thread that can withstand great force (17 kg) before tearing.Back tack mean A few stitches will be taken in reverse to secure a line of stitching. As you see, we will do back tack for the stitching. 5. Reinforcement for access areas, floor and column joints or wherever structure panels meet. 6.Safe flap inside the air tube. For the safety, we make safe flap inside the air tube.when the electricity is cut off and make the blower off suddenly，the flap will help to stop the air let out too quickly. So the kids can have enough time to leave the inflatable. 7. We make strong and smooth zipper at bottom of each inflatable. Above the zipper, there is a zipper cover, which is help to disperse the zipper's stress. We make strong and smooth zippers at bottom of each inflatable. Usually,there are two zippers on each small bouncers.And there are 3 to 4 zippers on bigger size. 8. Three years warranty with nice after-sale services. 9. We are a ONE STOP factory which can help you to arrange transport service. Didn't find what you're looking for? Please Contact Us. The materials for inflatable bouncers are made by PVC Tarpaulin. High-strength, fire-retardant It is fast and easy to install, inflate and deflate. The complete set includes bouncer, air blower for continuous use, and repairing kit. Suit for outdoor and indoor kindergarten and other amusement square.